Originally, I am a medical beautician. Over the last 27 years, I have embedded this foundational knowledge and work experience into my own holistic and shamanic work. Thus, in all individual treatments, the approaches of the energetic and superordinate realities are taken into account. Treatment of blemished skin and acne. The Ear Candle has been used as an old natural remedy by the indigenous peoples of North and Central America and indigenous peoples in the Indonesian-Asian region for more than 900 years. It could be rescued from the remedy treasure of primitive peoples into our modern world! 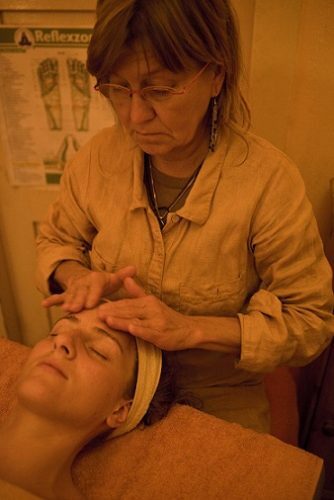 In natural medicine, the ear candle has a high priority. It is used as the basis and concomitant use of various disorders of the forehead, neck, nose, sinuses and ears. Ear candles are a pure natural product of natural tissue, beeswax and, depending on the variety, with honey extract, herb additives in powdered form, especially St. John’s wort, chamomile, horsetail, thyme, frankincense and sage added. Even today, they are still produced by hand. The effect of the ear candle can be explained in the simple and versatile application as a heat and pressure equalization therapy. It also acts on the external auditory canal to the zones of the lymphatic pharyngeal ring and parts of the reticulo-endothelial system (RES). Due to the stimuli set by the ear candling treatment, ear acupuncture points are fully grasped. The irritant effect continues through the eardrum (eardrum massage) transferred to the entire middle ear. From there, over the Hörknöchelchen, in the areas of the porticoes and the snail up to the cortischen organ. This affects the entire hearing system as well as the organ of balance. “Little Wellness Day” – with precious Weleda products. A very sensual wellbeing experience. If classical medicine can not help, it’s astonishing how talking-off troubles can effectively help, often the discomfort disappearing after a few sessions. The session length depends on the symptoms and diseases but approximately 30 minutes. Acute diseases are discussed in 3-4 sessions. Chronic complaints are discussed in 3-6 sessions; the interval between sessions depends on the diseases. Cost of a session 40 Euro – There are no gift certificates for this! All treatments are also available as a personalized gift certificate! Agreed appointments can be canceled or postponed until 24 hours before treatment. In case of later cancellation I charge a cancellation fee of 30 percent of the respective treatment costs. This also applies to voucher customers. This reduces the voucher value by 30 percent.